Since I began blogging, ideas for recipes, plating and combining ingredients hit me at odd times, like during the morning commute to work, at 2 a.m. or while I’m having a conversation with someone else that has nothing to do with food. 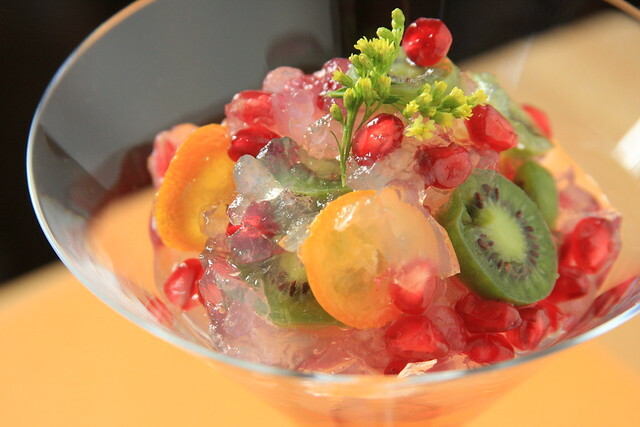 The last idea I had was this: use my silicone cube tray to make “ice cubes” with tiny slivers of fruit suspended in a gelled solution of agar. The goal was to then lay these perfect cubes out in a row on a narrow serving tray to be photographed. As I got to work making the cubes, everything seemed to go according to plan, but when I released the finished gelled cubes from the tray, they slithered out in one big blob. After a little googling, I found out that the high acidity level in the fruit I used for this interferes with agar’s ability to gel properly. After a few brief moments of frustration, I carefully scooped some of the kanten into a martini glass and discovered that it was still really pretty to look at—and also tasted fantastic. Bring the water and agar to a small boil in a small saucepan. Reduce the heat slightly and whisk in the sugar and lime juice until dissolved, about 7 minutes. Pour the agar solution into a rectangular pyrex and throw in the sliced fruit. Place in the refrigerator for about an hour to slightly set. it is very pretty! i love that even though it didn't go according to plan, it still tasted fantastic! I'm impressed you were able to save it, I would have gotten frustrated and thrown it out, lol. You did a lovely job. Plating is definitely not my forte but your blog is full of wonderful inspiration.